Calendar of Treasury Books, Volume 31, 1717. Originally published by Her Majesty's Stationery Office, London, 1960. McAllaster, John, Collector of the Salt at Campbelltow 90. McArdy, John, Rebel prisoner transported to Virginia, 209. McBean (McBeane), Angus, Rebel prisoner transported to Virginia, 209. -, Danl., Rebel prisoner transported to Virginia, 209. -, Elias, Rebel prisoner transported to South Carolina, 206. -, Fra., Rebel prisoner transported to Virginia, 209. -, John, Rebel prisoner transported to Maryland or Virginia, 207. -, -, Rebel prisoner transported to Virginia, 209. -, -, Rebel prisoner transported to Virginia or Jamaica, 208. -, Lough, Rebel prisoner transported to South Carolina, 205. -, -, Rebel prisoner transported to South Carolina, 205. McCallum, Don., Rebel prisoner transported to South Carolina, 206. -, Dun., Rebel prisoner transported to South Carolina, 206. -, John, Rebel prisoner transported to Jamaica, 205. Maccartney (Macartney, McCartney), George, lieutenant general, ordered on an Expedition, 393; payment to, 122; regiment of, 99, 393, 502, 671. Maccarty, Elizabeth, Countess of Clancarty, children of, pension for, 176, 444, 639. McClasser, Alexr., Rebel prisoner transported to Jamaica, 206. Macclesfield, co. Chester, Mayor of, annuity to, for a preacher, 318, 438. McCloude, John, Rebel prisoner transported to South Carolina, 205. McCollum, John, Rebel prisoner transported to Virginia, 209. -, Mall., Rebel prisoner transported to Virginia, 209. McCook, John, Rebel prisoner transported to Antigua, 204. MacCoy (McCoy, McKoy), Daniel, Rebel prisoner transported to Antigua, 204. -, Don., Rebel prisoner transported to South Carolina, 206. -, Hugh, Rebel prisoner transported to South Carolina, 205. -, John, Rebel prisoner transported to South Carolina, 205. -, -, Rebel prisoner transported to Jamaica, 205. -, Pat., Rebel prisoner transported to Virginia, 209. -, Paul, Rebel prisoner transported to Antigua, 204. McCullagh, Robt., Rebel prisoner transported to Jamaica, 206. McCullow, John, Rebel prisoner transported to Virginia or Jamaica, 208. McDarran, Archd., Rebel prisoner transported to Maryland or Virginia, 207. McDermett, Angus, Rebel prisoner transported to Jamaica, 205. -, John, Rebel prisoner transported to Antigua, 204. McDermott, Angus, Rebel prisoner transported to Jamaica, 206. McDerton, Phillip, Rebel prisoner transported to Jamaica, 206. Macdonald (McDonald, Mack Donald), Alexander, pension for, 34, 489. -, -, coming from Spain, payment for, 266. -, Caul, Rebel prisoner transported to South Carolina, 205. -, Denis, Rebel prisoner transported to Jamaica, 205. -, Don., Rebel prisoner transported to South Carolina, 205. -, Donl., Rebel prisoner transported to Antigua, 204. -, Ja., Rebel prisoner transported to South Carolina, 206. -, -, Rebel prisoner transported to Maryland or Virginia, 207. -, -, Rebel prisoner transported to South Carolina, 206. -, Rore, Rebel prisoner transported to South Carolina, 206. -, William, Rebel prisoner transported to Jamaica, 206. McDowall, John, Collector of Customs and Salt Duty at Dumfries, 229. 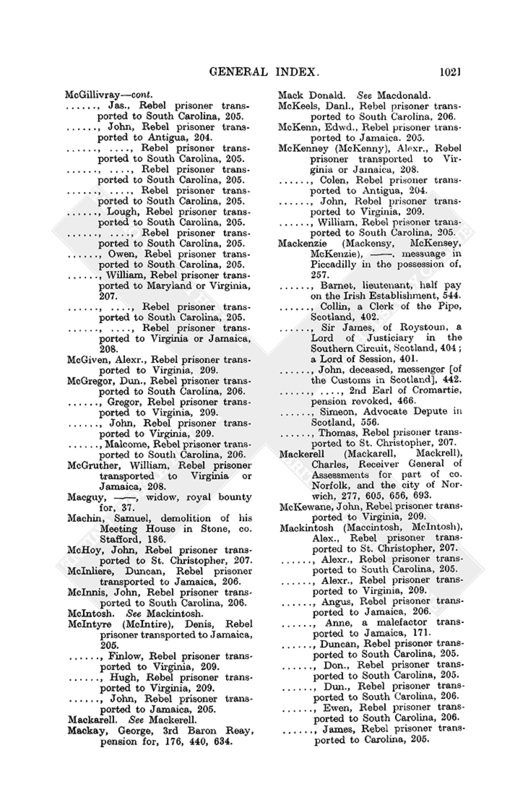 McDugall, Alex., Rebel prisoner transported to Maryland or Virginia, 207. -, Hugh, Rebel prisoner transported to Virginia, 209. McFale, Dum., Rebel prisoner transported to Virginia or Jamaica, 208. McFerlen, John, Rebel prisoner transported to Jamaica, 206. McGibbon, Dun., Rebel prisoner transported to Jamaica, 206. McGill, Thomas, tidewaiter at Dundee, 289. McGillivray, Alexr., Rebel prisoner transported to South Carolina, 205. -, Fargus, Rebel prisoner transported to South Carolina, 206. -, Farq[uha]r, Rebel prisoner transported to Maryland or Virginia, 207. -, Ja., Rebel prisoner transported to South Carolina, 205. -, Jas., Rebel prisoner transported to South Carolina, 205. -, Owen, Rebel prisoner transported to South Carolina, 205. -, William, Rebel prisoner transported to Maryland or Virginia, 207. McGiven, Alexr., Rebel prisoner transported to Virginia, 209. McGregor, Dun., Rebel prisoner transported to South Carolina, 206. -, Gregor, Rebel prisoner transported to Virginia, 209. -, John, Rebel prisoner transported to Virginia, 209. -, Malcome, Rebel prisoner transported to South Carolina, 206. McGruther, William, Rebel prisoner transported to Virginia or Jamaica, 208. Macguy, , widow, royal bounty for, 37. Machin, Samuel, demolition of his Meeting House in Stone, co. Stafford, 186. McHoy, John, Rebel prisoner transported to St. Christopher, 207. McInliere, Duncan, Rebel prisoner transported to Jamaica, 206. McInnis, John, Rebel prisoner transported to South Carolina, 206. McIntyre (McIntire), Denis, Rebel prisoner transported to Jamaica, 205. -, Finlow, Rebel prisoner transported to Virginia, 209. Mackay, George, 3rd Baron Reay, pension for, 176, 440, 634. 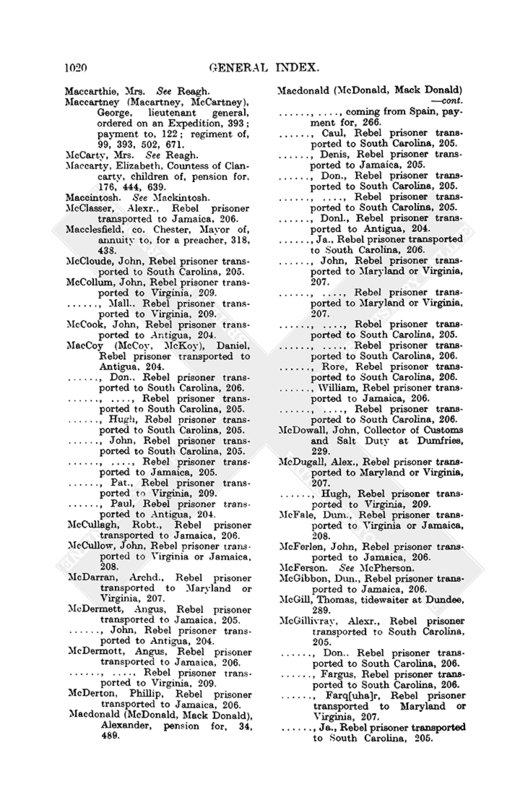 McKeels, Danl., Rebel prisoner transported to South Carolina, 206. McKenn, Edwd., Rebel prisoner transported to Jamaica. 205. McKenney (McKenny), Alexr., Rebel prisoner transported to Virginia or Jamaica, 208. -, Colen, Rebel prisoner transported to Antigua, 204. -, William, Rebel prisoner transported to South Carolina, 205. Mackenzie (Mackensy, McKensey, McKenzie), , messuage in Piccadilly in the possession of, 257. -, Barnet, lieutenant, half pay on the Irish Establishment, 544. -, Collin, a Clerk of the Pipe, Scotland, 402. -, Sir James, of Roystoun, a Lord of Justiciary in the Southern Circuit, Scotland, 404; a Lord of Session, 401. -, John, deceased, messenger [of the Customs in Scotland], 442. -, -, 2nd Earl of Cromartie, pension revoked, 466. -, Simeon, Advocate Depute in Scotland, 556. -, Thomas, Rebel prisoner transported to St. Christopher, 207. Mackerell (Mackarell, Mackrell), Charles, Receiver General of Assessments for part of co. Norfolk, and the city of Norwich, 277, 605, 656, 693. McKewane, John, Rebel prisoner transported to Virginia, 209. Mackintosh (Maccintosh, McIntosh), Alex., Rebel prisoner transported to St. Christopher, 207. -, Alexr., Rebel prisoner transported to South Carolina, 205. -, Alexr., Rebel prisoner transported to Virginia, 209. -, Angus, Rebel prisoner transported to Jamaica, 206. -, Anne, a malefactor transported to Jamaica, 171. -, Duncan, Rebel prisoner transported to South Carolina, 205. -, Ewen, Rebel prisoner transported to South Carolina, 206. -, James, Rebel prisoner transported to Carolina, 205. -, -, Rebel prisoner transported to Jamaica, 208. -, -, bailiff of Inverness, to be Collector of Inverness, 624. -, -, appointed as Collector at Inverness, 702. -, Jno., Rebel prisoner transported to South Carolina, 206. -, Laughlin, Rebel prisoner transported to Virginia, 209. -, Mal., Rebel prisoner transported to Antigua, 204. -, Soughn, Rebel prisoner transported to Antigua, 204. -, Thos., Rebel prisoner transported to Virginia or Jamaica, 208. -, William, pension for, 28, 424. -, -, Rebel prisoner transported to Antigua, 204. McLane, Allen, Rebel prisoner transported to Maryland or Virginia, 209. McLaren, John, Rebel prisoner transported to South Carolina, 206. McLawn, Pat., Rebel prisoner transported to South Carolina, 206. McLean (McLeane, McLearn, McLearne), Alexr., Rebel prisoner transported to Antigua, 204. -, Donald, Rebel prisoner transported to Jamaica, 205. -, Dun., Rebel prisoner transported to Antigua, 204. -, James, Rebel prisoner transported to Virginia, 209. -, Peter, Rebel prisoner transported to Antigua, 204. -, Walter, Rebel prisoner transported to St. Christopher, 207. 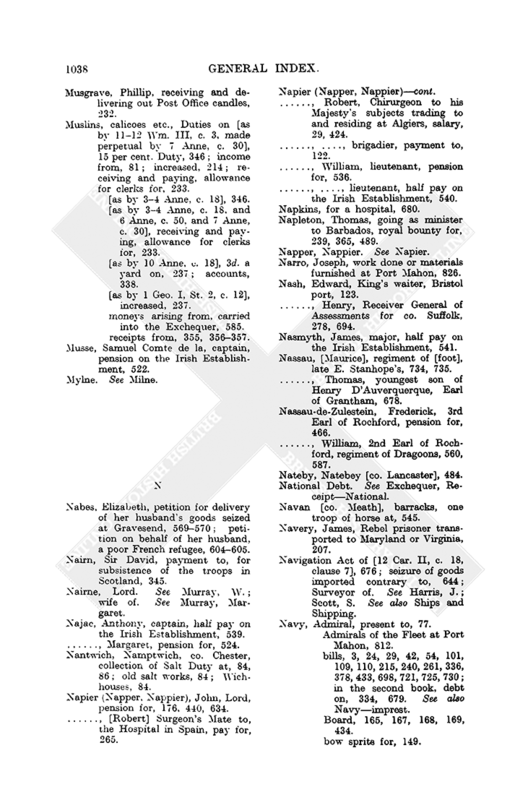 McLoughlan, John, Rebel prisoner transported to Maryland or Virginia, 207. McLoughlin, Archd., Rebel prisoner transported to Virginia or Jamaica, 208. McNabb, Thomas, Rebel prisoner transported to Maryland or Virginia, 207. Macnamara, Thomas, royal bounty for, 265. McNaughton (McNoughton), Dun., Rebel prisoner transported to South Carolina, 206. -, John, tidewaiter at Montrose, 626. -, Male, Rebel prisoner transported to Virginia or Jamaica, 208. McNeal, Henry, captain, half pay on the Irish Establishment, 542. McNebb, Alexr., Rebel prisoner transported to Jamaica, 206. -, John, Rebel prisoner transported to Jamaica, 206. McNernier, Duncan, Rebel prisoner transported to Jamaica, 206. McPherson (McFerson), Alexr., Rebel prisoner transported to Jamaica, 206. -, Angus, Rebel prisoner transported to South Carolina, 206. -, Daniel, Rebel prisoner transported to Antigua, 204. -, Don., Rebel prisoner transported to St. Christopher, 207. -, -, Rebel prisoner transported to South Carolina, 204. -, Donald, Rebel prisoner transported to South Carolina, 206. -, John, Rebel prisoner transported to South Carolina, 206. -, Owen, Rebel prisoner transported to Virginia, 208. -, William, Rebel prisoner transported to Virginia, 209. McQueen, Alexr., Rebel prisoner transported to Maryland or Virginia, 207. -, David, Rebel prisoner transported to Maryland or Virginia, 207. -, Dugall, Rebel prisoner transported to Maryland or Virginia, 207. -, Dun., Rebel prisoner transported to South Carolina, 205. -, Hector, Rebel prisoner transported to Maryland or Virginia, 207. McQuin, Alexr., Rebel prisoner transported to South Carolina, 205. -, Dun., Rebel prisoner transported to Virginia or Jamaica, 208. Macroom, Macroome [co. Cork], barracks, one company of foot at, 546. McVane, John, Rebel prisoner transported to South Carolina, 206. -, Mall., Rebel prisoner transported to South Carolina, 206. Madden, Anthony, master of the London, 172. Maddison, Geo., a Gentleman Pensioner, 457. 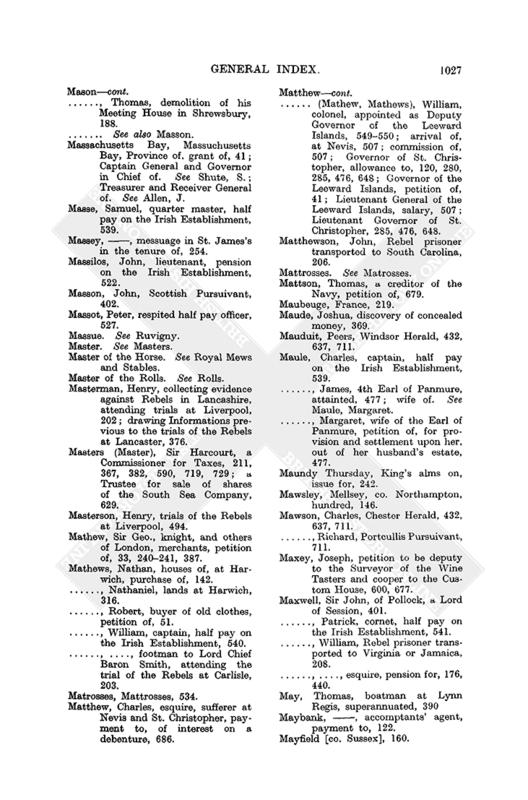 Maddockes (Madockes, Madocks), Charles, recommended to the Commissioners of Revenue in Ireland for employment, 673. -, Thomas, a Receiver of the 1,400,000l. Lottery anno 1714 [13 Anne, c. 18], petition of, 720. -, -, gentleman, Chief Cashier of the Bank of England, 83, 163, 311. Madrid, advance of British troops of, 116; Court of, Envoy Extraordinary and Plenipotentiary at. See Bubb, G.; Secretary at. See Uzardi, Don J. B.
Maestrecht, Holland, corn for the Army lost at, 805. Maggot Moor. See Whittlewood Forest. Magill, David, cornet, half pay on the Irish Establishment, 541. Magny, [Constantine De], colonel, regiment of Dragoons, 734, 735; regiment of foot, 734, 735. Magwire, Daniel, pension for, 520. Maidstone, co. Kent, surveyor, waiter and searcher at, 389. Maimbre, Peter, ensign, respited half pay officer, 527. Maimin, , House of Commons order served, 321. Mainandue, Alcide, lieutenant, pension for, 523. Maine, , royal bounty for, 68. Maisley, co. Banff, lands of, 470. Maitland, , Surgeon's Mate to the Hospital in Spain, pay for, 265. -, Alexander, esquire, Baron of the Exchequer, Scotland, 402. -, Charles, a Macer of Session, Scotland, 403. -, -, 6th Earl of Lauderdale, General of the Mint in Scotland, 493, 507; memorial of, 37; report on a silver mine countersigned by, 375. -, [James], lieutenant general, regiment of, 111; second major to. See Gordon, Sir H.
Maizeaux, Peter des, pension for, 524. Majorca, English Consul at. See Conrado, Don Juan Andrew; plaster bought at, for works at Port Mahon, 567, 820; Vice Roy of, provisions received from, for Port Mahon, 827. Majoribanks, Andrew, Writer of Hornings, 616. Malcome, James, Rebel prisoner transported to Virginia or Jamaica, 208. Maldon, co. Essex, boatman at, 646. Malherbe, Francis, pension for. 525. Malie, Peter, Quarter Master, pension on the Irish Establishment, 521. Malleray, Isaac, lieutenant, pension on the Irish Establishment, 521. Mallinson, Jonathan, waiter and searcher at Wareham, 551. Mallone, James, Rebel prisoner transported to Virginia, 209. Mallow [co. Cork], barracks, one troop of horse at, 546. Malquire, Lewis La, captain, pension on the Irish Establishment. 521. Malt, Mum, Cyder and Perry, Duties on, accounts of, 69, 338. 717718. -, amount of, 17071708, 350, 351, 352, 353, 355, 356. -, [as by 8 Anne, c. 2], payment into the Exchequer on, for 1710, 329. -, [as by 9 Anne, c. 2], payment into the Exchequer on, for 1711, 330. -, [as by 10 Anne, c. 7], payment into the Exchequer on, 331. -, [as by 12 Anne, c. 2], payment into the Exchequer on, 332. -, [as by 1 Geo. I, St. 2. c. 2], 436. -, [as by 1 Geo. I. St. 2, c. 36] anno 1716, 436. -,-, deficiency of, certificate of, demanded, 678. -,-, loans on, 6; amount of, in the Exchequer, 399; issues out of, 113, 148. 150. -,-, money of, issues out of, 5. -, [as by 3 Geo. I, c. 4], anno 1717, 32, 436, 468, 601, 620, 631. -,-, issue out of, 71. -,-, loans on, interest of 4 per cent. on, 601, 631; issues out of, 51, 55, 58, 59, 60, 61, 604, 606, 613, 620, 632, 664, 666, 730; warrants for taking in, 601, 631, 723. -,-, deficiency of, certificate of, demanded, 619; transfers of, 328, 329. -,-, moneys arising from, carried into the Exchequer, amount of, 512, 585. -,-, payment into the Exchequer on, for the year 1708, 328. -,-, payment into the Exchequer on, for the year 1709, 329. -,-, revenue from, computation of, 347. -,-, tallies and orders, assignment of, 155; disposal of, 5; loans on, 2,100; loans on, interest on, 2,100; loans repaid by, 154155. Malton, Jeremiah, fields in Harwich in the tenure of, 315. Man, Isle of, poor ministers in, annuity or pension for, 174, 438, 636; surveyor, waiter and searcher at, 252. Manaton, Francis, grant of an estate in Leicestershire, 95. -, -, Receiver General of Assessments for co. Cornwall, 14, 279, 491. Manchester, co. Lancaster, 109, 143, 483; Meeting House, demolished in a riot, 187; Rebels executed at, 106. Manchester, Earl of. See Montagu, C.
Mander, , discovery of money by Elizabeth Walker, 481. Mankin, Michael, captain, commander of the Friendship, 203, 207. Manley (Manly), Isaac, Deputy Postmaster of Ireland, pension to be replaced by a payment out of the Post Office revenue, 38,507. -, William, Collector of the Salt in Ayr, 290. Mann (Man), , widow, tenements in Pall Mall Field belonging to, 257. -, Daniel, Comptroller of Cardiff port, 695. -, Jeffry, riding officer from Wells to Lynn Regis, 252, 291. -, [John], payment to, for General Ross's regiment of Dragoons, 266. -, John, Comptroller of Cardiff port, 695. -, Robert, gentleman, allowance to, for paying quarters of the out pensioners of Chelsea Hospital, 114. -, Thomas, Keeper of the Treasury Chambers, attendance etc. for the Treasury Office, issue for, 211, 383; letters patent as Keeper revoked, 476. Manning, Francis, esquire, Resident with the Cantons of Switzerland, 226, 456, 611. Manor Hamilton [co. Leitrim], barracks, one company of foot at, 546. -, Richmond, alias West Sheen. -, St. James in the Fields. Mansell, Robert, demolition of his Meeting House in Birmingham, 188. Mansergh, Daniel, captain, half pay on the Irish Establishment, 541. Mar, Countess of. See Erskine, Frances. Mar, Earl of. See Erskine, John. Marais, Charles Du, quarter master, half pay on the Irish Establishment, 539. March, Francis, of London, merchant, agreement for transporting malefactors to the Plantations, 171, 251. Marchiennes, France, body of troops at, for securing the pass, 806. Marchmont, Earl of. See Hume, Patrick. Marconnay, Samuel, lieutenant colonel, respited half pay officer, 528. Mardyck, Mardyke, France, demolition of works at, 365, 405. Marest, Charles du, lieutenant, pension on the Irish Establishment, 521. Maret, William, captain, respited half pay officer, 528. Margarett, Paul, Surgeon to the Hospital in Spain, pay for, 267. Margate [co. Kent], officer for Salt duties at, 84, 85. Marget, Daniel, labourer, pressing hay, 419. Maria, Anthony la, captain, pension for, 523. Marine, Francis, the elder, a Trumpet in the Southern Circuit, Scotland, 405; Scottish Pursuivant, 402. -, -, the younger, a Royal Household Trumpet, Scotland, 403; a Trumpet in the Northern Circuit, Scotland, 404. -, James, a Royal Household Trumpet, Scotland, 179, 403; a Trumpet in the Southern Circuit, Scotland, 405. Marines, Commissioners for disbanding, petition for payment of their charges, 620. -, detachment of, doing duty at Port Mahon, 567, 823. -, disbanded officers, half pay for, 51. -, headquarters of, at Southampton, Winchester, Chichester and Canterbury, 130131, 698. -, in Spain, subsistence, 164. -, of the late Queen's sattees at Port Mahon, provisions for, 828. -, officers of, disbanded, half pay for, 606; widows of, assignment of South Sea Stock to, 92. -, Paymaster of, accounts of, 446, 578. -,-, issues to, 164, 698. -,-, payments by, 130, 698. -,-, petition referred to, 199. -,-, to give an account of any debts owing to Marine regiments, 737. -,-, transfer of South Sea Stock, 92, 725. -,-, See also Mostyn, Sir R.
-, regiments, debt due to, 337. -,-, (General Holt's), 199; lieutenant in. See Mercer, T.
-,-, mustering and disbanding, 130131, 698. -,-, pay, deductions from, for subsistence of officers, 92. Mark (Marke), John, of London, goldsmith, petition for the innovation of lost Lottery Tickets, 620, 632. Marks, 499, 633, 636, 638. Marlborough, Duchess of. See Churchill, Sarah. Marlborough, Duke of. See Churchill, John. Marlor, James, damages to his Meeting House in Failsworth, 187. Marriages, Births and Deaths, Duties on, amount returned from cos. York, Durham and Northumberland for four years and four months ending 1 Aug. 1706, 655656. -, payment into the Exchequer of, 112. -, Receiver of, surplusage on accounts, money warrant for, 482. -, Receiver General of, 657, 658; charges of returning moneys, 655656; extraordinary charges of, 104. Marriott (Mariot, Marriot), Thomas, Clerk of the Pleas in the Court of Exchequer, 443; Master of the Office of Pleas of the Exchequer Court, 140, 303. Marris, Robert, boatman at Hull, 181. Marsay, Seigneur de. See St. George, A. L. de. Marshal (Marchal, Marshall), . petition of, 26. -, -, Commissary serving in Flanders, pay and forage for, 267. -, David, order for a Banker's annuity, 623. -, John, waiter and searcher at Appledore, superannuated, 390; landwaiter at Appledore, 437. -, Richard, King's Stud Master, payment to, 212, 393; petition of, 157, 387. -, Walter, Receiver General of Assessments for co. Gloucester and the city and county of the City of Gloucester, 277. Marti, Don Joseph, colonel of a Spanish regiment of foot, case and representation of, 45, 600, 851852. Martimore, Geo., Rebel prisoner transported to Jamaica, 206. Martin (Marten, Martine), Alexander, Scottish Herald, 402. -, Edward, riding officer at Bourne and Pevensey, 291. -, George, ensign, half pay on the Irish Establishment, 543. -, [Henry], Inspector General of Imports and Exports, 554. -, Henry, captain, half pay on the Irish Establishment, 542. -, [James], Receiver of Taxes for co. Surrey, 13. -, John, keeping the lions in the Tower, 90, 269. -, -, Customs waiter at St. John, Antigua, 552. -, Nathaniel, tenant of a messuage in High Holborn, 370. -, Richard, memorial of, 22. -, Robert, Collector of Excise at Aberdeen, 371. -, Samuel, money for the fortifications of Port Mahon, 813. -, William, Rebel prisoner transported to Virginia or Jamaica, 208. Martison, John, Rebel prisoner transported to Maryland or Virginia, 207. Marx. Frederick, Director of the Hospitals in Spain, payment to, for the use of the said Hospitals, 113, 133. Maryborough, Maryborrow [Queen's County], barracks, one troop of horse at, 545. Maryland Province, North Potomac River in, Collector of. 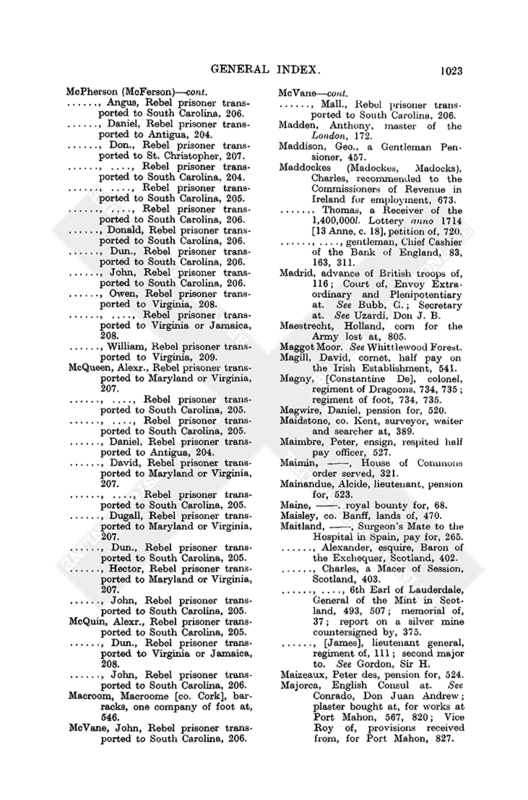 See Bowles, J.; Low, T.
-, Patuxent, Pattuxon, River in, Collector of. See Dansey, J.; Rousbey, J. -, Rebel prisoners shipped at Liverpool for transportation to, 203, 207. Mas, Franco, junior, work done or materials furnished at Port Mahon. 826. Masham, Francis Cudworth, Foreign Apposer, 445. -, Samuel, Baron Masham, discharged from an imprest roll, 174; King's Remembrancer, 287; late Cofferer of the Household, 96, 139140, 602, 622. Mason, Charles, late Treasurer for the Transport Service, stay of process, 603. -, Geo., of the city of Bristol, merchant, security bonds, 380. -, Hugh, seizure of yarn by, 143. -, Joseph, esquire, Comptroller of First Fruits and Tenths, 218. -, Robert, tidesurveyor at Hull, superannuated, 252. -, Thomas, demolition of his Meeting House in Shrewsbury, 188. Massachusetts Bay, Massuchusetts Bay, Province of, grant of, 41; Captain General and Governor in Chief of. See Shute, S.; Treasurer and Receiver General of. See Allen, J. Masse, Samuel, quarter master, half pay on the Irish Establishment, 539. 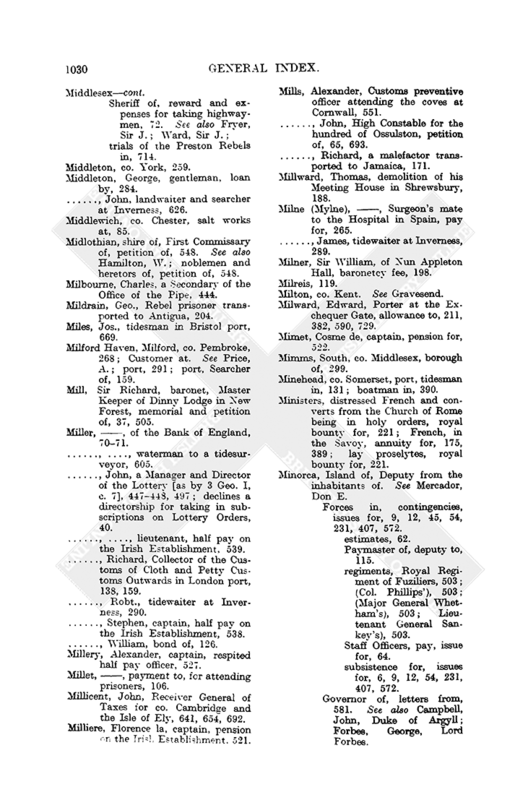 Massey, , messuage in St. James's in the tenure of, 254. Massilos, John, lieutenant, pension on the Irish Establishment, 522. Masson, John, Scottish Pursuivant, 402. Massot, Peter, respited half pay officer, 527. Master of the Horse. See Royal Mews and Stables. Master of the Rolls. See Rolls. Masterman, Henry, collecting evidence against Rebels in Lancashire, attending trials at Liverpool, 202; drawing Informations previous to the trials of the Rebels at Lancaster, 376. Masters (Master), Sir Harcourt, a Commissioner for Taxes, 211, 367, 382, 590, 719, 729; a Trustee for sale of shares of the South Sea Company, 629. Masterson, Henry, trials of the Rebels at Liverpool, 494. 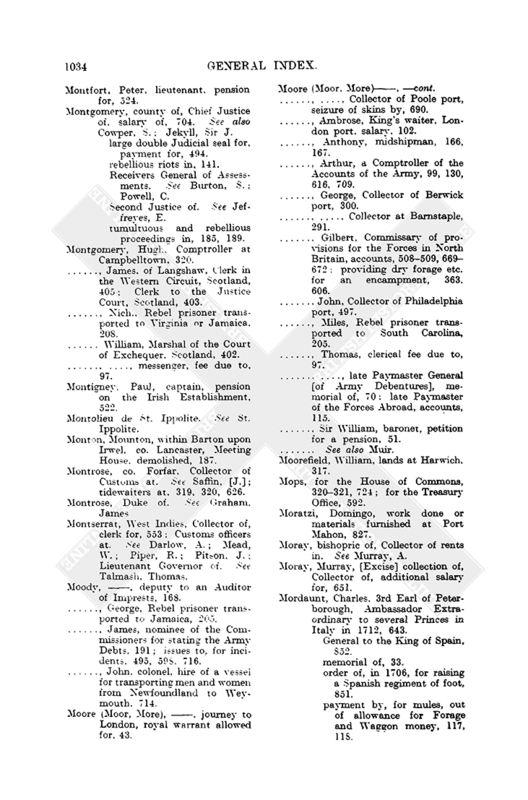 Mathew, Sir Geo., knight, and others of London, merchants, petition of, 33, 240241, 387. Mathews, Nathan, houses of, at Harwich, purchase of, 142. -, Nathaniel, lands at Harwich, 316. -, Robert, buyer of old clothes, petition of, 51. -, William, captain, half pay on the Irish Establishment, 540. -, -, footman to Lord Chief Baron Smith, attending the trial of the Rebels at Carlisle, 203. Matthew, Charles, esquire, sufferer at Nevis and St. Christopher, payment to, of interest on a debenture, 686. -, (Mathew, Mathews), William, colonel, appointed as Deputy Governor of the Leeward Islands, 549550; arrival of, at Nevis, 507; commission of, 507; Governor of St. Christopher, allowance to, 120, 280, 285, 476, 648; Governor of the Leeward Islands, petition of, 41; Lieutenant General of the Leeward Islands, salary, 507; Lieutenant Governor of St. Christopher, 285, 476, 648. Matthewson, John, Rebel prisoner transported to South Carolina, 206. Mattson, Thomas, a creditor of the Navy, petition of, 679. Maude, Joshua, discovery of concealed money, 369. Mauduit, Peers, Windsor Herald, 432, 637, 711. Maule, Charles, captain, half pay on the Irish Establishment, 539. -, James, 4th Earl of Panmure, attainted, 477; wife of. See Maule, Margaret. -, Margaret, wife of the Earl of Panmure, petition of, for provision and settlement upon her, out of her husband's estate, 477. Maundy Thursday, King's alms on, issue for, 242. Mawsley, Mellsey, co. Northampton, hundred, 146. Mawson, Charles, Chester Herald, 432, 637, 711. -, Richard, Portcullis Pursuivant, 711. Maxey, Joseph, petition to be deputy to the Surveyor of the Wine Tasters and cooper to the Custom House, 600, 677. Maxwell, Sir John, of Pollock, a Lord of Session, 401. -, Patrick, cornet, half pay on the Irish Establishment, 541. -, -, esquire, pension for, 176, 440. Maybank, , accomptants' agent, payment to, 122. Maynard, Banastre, captain, half pay on the Irish Establishment, 541. -, Grey, esquire, furniture etc. delivered to, out of the Great Wardrobe, 651652; washing sheets, payment for, 573. -, William, esquire, recommended as Collector of Excise at Cork, 506, 662. Mayo, John, of West Bromwich, damaged in his goods, 186. -, Thomas, sheriff of co. Hereford, 609. Mead (Meade), John, memorial of, 38, 46. -, -, senior, post entries of brandies and rum imported above proof, 423. -, -, esquire, [Deputy Paymaster in Portugal], 116; Deputy Paymaster in Spain, 559, 810, 811, 833, 852; petition for payment for bread and forage furnished the Portuguese Troops in 1706, 574. -, Joslin, captain, half pay on the Irish Establishment, 542. -, William, Customs waiter at Old Road, Montserrat, 553. Meadowcroft, Richard, Customs waiter at White Flag Bay, St. Christopher, 553. Meadows (Medows), Peter, tidesman in the port of Wisbech, 262. -, Sir Philip, knight, a Comptroller of Army Accounts, 161, 670, 699; pension for, 177, 445, 636. Meares, Lewis, Escheator General of the Province of Leinster, petition of, 377. See also Meers. Meath, Bishopric, Bishop of, perpetuity for, 518. Meaux, Meux, alias Melsa, Melso, alias Meux, co. York, monastery of, Fewson's Grange, Fewsons Grange, parcel of the demesne lands of, demise of, 126, 297. Meckum, Edward, able bodied seaman, 166, 167. -, Richard, lease of land in Rosedale manor, 311312. -, William, son of John, tenant of a messuage etc. in Rosedale, 259. Meddale [? Meddat, co. Ross and Cromarty], barony of, Chamberlain of. See Strathnaver, William, Lord. Medicines, for poor workmen at Port Mahon, 567. Medicines, for poor workmen at Port Mahon, 567. Medina, Sir Solomon de, account of, 68, 69; account of, for bread and bread waggons, report of the Army Debts Commissioners to the House of Commons on, 720, 803810; contract for providing bread for the Army in the Netherlands in 1711, 738, 856. Medlicot (Medlycot, Medlycott), Charles, Commissary General of Stores and Provisions for the Army when in Portugal, petition of, 643; Commissary of Stores, petition of, 56; Commissary of Stores at Gibraltar, 309. -, Thomas, Commissioner of the Revenue in Ireland, leave of absence to come into England, 48, 590. Meek, Anthony, Undersearcher of London port, 112. Meers, Alexander, post entries of brandies and rum imported above proof, 423. Meeting Houses. demolished in the late tumultuous riots, 185189. Meggott, , Justice, at Kensington Assizes, 500. Meknes, Mequeness, Morocco, 88, 89. Melliar, James, Comptroller of Bridgwater port, 159. Mellsey, co. Northampton. See Mawsley. Melon, James, lieutenant, respited half pay officer, 528. Melonire (Melonier), [Isaac de la], regiment of, at the Reduction of Ireland, 521, 526. -, in Flanders, 521, 526. -, officers of, pensions for, list of, 521, 522; respited half pay, list of, 526527. -, returned into Ireland, 521. Melonnire, Ann de la, pension for, 524. Melsa, Melso, alias Meux, co. York, monastery of. See Meaux. Melvill, Walter, Scottish Herald, 402. Melvin, Charles, a General Surveyor under the Revenue Commissioners in Ireland, 506, 662; removed from being Collector of Excise at Dublin, 506, 662. Melyer, Csar, captain, pension for, 522. Mendez, James, post entries of brandies and rum imported above proof, 423. Menival, Francis, captain, pension for, 524. Menzies (Meinzies, Minzies), Archd., Rebel prisoner transported to Virginia or Jamaica, 208. -, James, ensign, half pay on the Irish Establishment, 542. -, Robert, Rebel prisoner transported to Virginia or Jamaica, 208. -, Sir William, and partners, petition of, concerning a lease of the Customs and Foreign Excise in Scotland, 302303. Mercador, Don Emanuel, Deputy from the inhabitants of the island of Minorca, allowance to, 103, 216217, 298, 423, 588, 643, 672. Mercer, John, Chief Clerk of the Works, patent revoked, 24, 466; late Clerk Engrosser to the Works, 635. -, Thomas, Accomptant General, of the Bank of England, 311; accounts signed by, for the Bank of England, 154, 155. -, -, lieutenant in General Holt's regiment of Marines, petition of, 199. Mercier, Martha, pension for, 524. -, Peter, lieutenant, respited half pay officer, 527. Meredyth, [Thomas], lieutenant general, regiment [of foot] at Gibraltar, 503. Merest, James, under clerk attending the House of Peers, 579. Mergibanks [Marjoribanks], Geo., Rebel prisoner transported to Virginia or Jamaica, 208. Merioneth, county of, Chief Justice of. See Jessop, W.; Receivers General of Taxes. 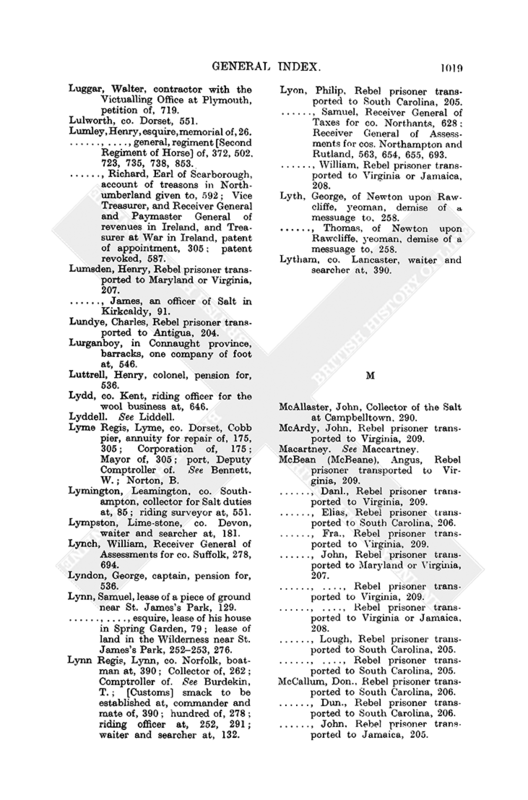 See Caswall, J.; Conway, J.; Hampton, R.; Second Justice of. See Cumberbatch, R.
Merrett, Joshua, tidesman in Bristol port, 669. -, Thomas, oats delivered to the Army by, 706. Merrick, Robert, clerk to a Judge at the trial of the Rebels at Carlisle, 202. Merrifield, George, clerical fee due to, 97. Merril, , respited pay, 266. Merrill, John, esquire, Deputy to J. Howe, late Paymaster of the Forces, 69, 140, 181, 699. Mesnil, Frederick du, pension for, 524. Mestre, John le, lieutenant, respited half pay officer, 528. Mesurier, Thomas le, petition of, 92. 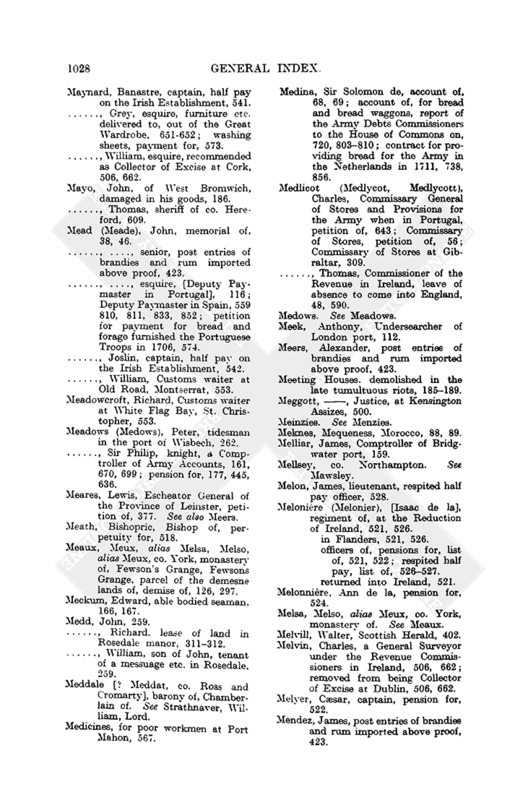 Metcalfe, Henry, clerical fee due to, 97. Methuen, , late ambassador at the Court of Portugal, bill of exchange drawn on, 850851. -, Paul, a Lord of the Treasury, 4, 11. 210, 270; a Principal Secretary of State, 22, 76, 77, 79, 82, 103, 104, 150, 151, 213, 217, 227, 270, 287, 456; grant of plate to, for his good services, 480; secret service issues, 216, 295. Meuse, the, British, Prussian and Auxiliary Troops upon, 804; Prussian and other Troops upon the, 809. Meux, co. York, monastery of. See Meaux. Mevagissy, co. Cornwall, officer for Salt Duties to be established at, 105; pilchard fishery at, 104; riding officer of the Customs at, to take care of the Salt Duties, 104. Meyran, John, lieutenant, half pay on the Irish Establishment, 539. Meysey, Thomas, surveyor in the Hawkers and Pedlars Office, petition of, 425. Meystnor, Nathaniel, tenancy of land at Harwich, 104, 270. Mezerac, Anthony de, cornet, pension for, 524. Mickey, John, Rebel prisoner transported to Virginia or Jamaica, 208. Micklethwaite (Micklethwait, Micklethwayte), Thomas, a Lord of the Treasury, 11, 12, 13, 14, 15, 16, 17, 18, 19, 20, 21, 22, 23, 24, 25, 27, 28, 29, 30, 33, 35, 36, 37, 39, 40, 42, 43, 44, 45, 48, 50, 52, 53, 54, 56, 57, 58, 59, 60, 62, 63, 64, 65, 67, 68, 69, 70, 71, 270, 383, 591, 727; assaulted and fired upon, 458; late Treasurer or Paymaster of the Transports, 626, 698. Middleham, co. York, Castle, Constable of. See Darcy, Robert, Earl of Holdernesse. Middlesex, county of, Excise of, annuity granted out of, 299. -, Receiver General of the Duties on Houses, 215, 217. See also Fazakerley, Sir W.
-, trials of the Preston Rebels in, 714. Middleton, George, gentleman, loan by, 284. -, John, landwaiter and searcher at Inverness, 626. Middlewich, co. Chester, salt works at, 85. Midlothian, shire of, First Commissary of, petition of, 548. See also Hamilton, W.; noblemen and heretors of, petition of, 548. Milbourne, Charles, a Secondary of the Office of the Pipe, 444. Mildrain, Geo., Rebel prisoner transported to Antigua, 204. Miles, Jos., tidesman in Bristol port, 669. Milford Haven, Milford, co. Pembroke, 268; Customer at. See Price, A.; port, 291; port, Searcher of, 159. Mill, Sir Richard, baronet, Master Keeper of Dinny Lodge in New Forest, memorial and petition of, 37, 505. Miller, , of the Bank of England, 7071. -, -, waterman to a tidesurveyor, 605. -, John, a Manager and Director of the Lottery [as by 3 Geo. I, c. 7], 447448, 497; declines a directorship for taking in subscriptions on Lottery Orders, 40. -, -, lieutenant, half pay on the Irish Establishment, 539. -, Richard, Collector of the Customs of Cloth and Petty Customs Outwards in London port, 138, 159. -, Robt., tidewaiter at Inverness, 290. -, Stephen, captain, half pay on the Irish Establishment, 538. -, William, bond of, 126. Millery, Alexander, captain, respited half pay officer, 527. Millet, , payment to, for attending prisoners, 106. Millicent, John, Receiver General of Taxes for co. Cambridge and the Isle of Ely, 641, 654, 692. Mills, Alexander, Customs preventive officer attending the coves at Cornwall, 551. -, John, High Constable for the hundred of Ossulston, petition of, 65, 693. -, Richard, a malefactor transported to Jamaica, 171. Millward, Thomas, demolition of his Meeting House in Shrewsbury, 188. Milne (Mylne), , Surgeon's mate to the Hospital in Spain, pay for, 265. -, James, tidewaiter at Inverness, 289. Milner, Sir William, of Nun Appleton Hall, baronetcy fee, 198. Milton, co. Kent. See Gravesend. Milward, Edward, Porter at the Exchequer Gate, allowance to, 211, 382, 590, 729. Mimet, Cosme de, captain, pension for, 522. Mimms, South, co. Middlesex, borough of, 299. Minehead, co. Somerset, port, tidesman in, 131; boatman in, 390. Ministers, distressed French and converts from the Church of Rome being in holy orders, royal bounty for, 221; French, in the Savoy, annuity for, 175, 389; lay proselytes, royal bounty for, 221. Minorca, Island of, Deputy from the inhabitants of. See Mercador, Don E.
-, Forces in, contingencies, issues for, 9, 12, 45, 54, 231, 407, 572. -,-, Paymaster of, deputy to, 115. -,-, regiments, Royal Regiment of Fuziliers, 503; (Col. Phillips'), 503; (Major General Whetham's), 503; Lieutenant General Sankey's), 503. -,-, Staff Officers, pay, issue for, 64. -,-, subsistence for, issues for, 6, 9, 12, 54, 231, 407, 572. -, Governor of, letters from, 581. See also Campbell, John, Duke of Argyll; Forbes, George, Lord Forbes. -, gratuity for widows whose husbands had been hanged for inviting the Allies to, 568, 824. -, journey from, charge of, 461, 581. -, measure of corn, 811. -, Receiver General of. See Gascoigne, J. -, revenues of, state of, 69. Minshall, Richard, late of Boreton, co. Bucks, esquire, outlaw, 140, 303. Mint, The (England), amount of revenue applicable to, 348. -, appropriations for, out of Customs Duties, 358, 359. -, Auditor of. See MintMaster and Worker. -, Books, receipts and deliveries of copper and moneys to be entered in, 576. -, coin, silver, scarcity of, 44. -, coinage, issue for. See Newton, Sir I. -, coinage Duty for. See CustomsDuties; Scotland, CustomsDuties. -, coining copper money, warrant for, 45. -, coining farthings and half pence, 39, 40, 43, 63, 450, 486, 609. -, Comptroller of, memorial of the Agents for Tin referred to, 714. -, copper, 13, 30, 39, 40, 450, 486. -,-, bars, size and thickness of, 575. -,-, contractor for, cutter for sizing bars delivered to, 571. -,-, fine, proposals for importing for coining farthings and halfpence, 40. -,-, for coining, at 18d. per pound, 43; halfpence and farthings, furnished at 18d. per pound, 574; halfpence and farthings, petition to furnish at 17d. per pound, 574. -,-, money to be stamped Georgius Rex on one side and an effigy of Britannia and the inscription Britannia to be stamped on the other side, 576. -,-, pound weight to be cut into 23 pence, 40. -,-, price of, not to exceed 18 pence by the pound weight, 576. -,-, supply of, for coining farthings and halfpence, proposals for, list of, 450. -, farthings, to be coined, 13; to be of a size that 92 equal a pound avoirdupois, 575. -, gold and silver, effectual proportion of, method of, 44. -, halfpence, to be coined, 13; to be of a size that 46 equal a pound avoirdupois, 575. -, King's Clerk, allowance to, of 20 shillings sterling by the ton of all copper moneys coined, 577, 621; for keeping the Mint Books, 576. See also Walker, R.
-, Master and Worker, allowance of 20 shillings sterling by the ton of all moneys coined, 577. -,-, instructions and directions to, concerning the coinage of copper halfpence and farthings, 575577. -,-, memorial of the Agents for Tin referred to, 714. -,-, petition referred to, 574. -,-, to account annually as Auditor of the Mint for all copper moneys coined, 576577. -,-, to coin such quantities of money as the Treasury shall allow, 576. -,-, See also Newton, Sir I. -, Moneyers, not to sell new moneys before the same be duly assayed, 576. -, plate bought in, at high rates for recoinage, 63. -, Principal Officers, 30, 31, 41, 51, 620. -,-, reports by, 37, 39, 41. -,-, to attend the Treasury, 28, 40. -,-, to give an account of Tin. 46, 4849. -,-, to send a report on proposals for supplying the Mint with British copper, 486. -,-, to send an account of farthings and halfpence coined, 63, 674. -,-, to send an account of gold and silver coined, 63, 674. -, silver, melting and export of, profit on, to cease, 44; Spanish, to be coined, 96. -, Warden of, clerk to, allowance to, for prosecuting coiners, 59. -,-, prosecution of counterfeiters and diminishers etc. of the coin under the, 500. -,-, should prosecute coiners, 59. -,-, See also Peyton, C.; Sandford, Sir R.
Mira, Jos., lieutenant colonel, pay due to, as Captain of Dragoons at Alicante, 851853. Mirascon, David, hair merchant trading to Holland, petition of, 650. Miremont (Merrimont), Marquis D', pension for, 536; regiment of, officers of, who served in Flanders and were afterwards reduced in Ireland, pensions for, 524. Mires, Joshua, landwaiter and coast-waiter in Poulton port, 291. Missing, Thomas, esquire, Contractor for victualling the Garrison of Gibraltar, payment to. 19, 366, 450, 462, 608, 617; demand of, 48; memorial sent to, 48; provisions delivered to, 127, 365, 388, 550; to give an account of his contract, 589. Mitchelburne, John, colonel, half pay on the Irish Establishment, 537; regiment of, 537. Mitchell (Michel, Michell), David, Rebel prisoner transported to Virginia or Jamaica, 208. -, George, Rebel prisoner transported to South Carolina, 205. -, James, Rebel prisoner transported to Maryland or Virginia, 207. -, -, quarter master, pension for, 524. -, John, a Macer of Session, Scotland, 403. -, -, messuages in High Holborn demised to, 370. -, Thomas, post entries of brandies and rum imported above proof, 423. -, William, chaplain in ordinary in Scotland, inserted on the Civil List of Scotland, 148. -, -, King's chaplain, rents of the Deanery of the Chapel Royal payable to, 138, 381. Mitchelson (Mitchelsone), Daniel, tidewaiter at Montrose, 626. -, John, Keeper of the Register of Hornings, 403. Mitford, co. Norfolk, hundred, 278. Modena, Duke of, Envoy Extraordinary to. See Davenant, H.
Mogallow [? Mogeely], co. Cork, 617. Mohun, John, a Gentleman Pensioner, 457. -, -, captain, coming express from Spain, payment for, 266. Molasses, spirits extracted from, account of the revenue from, asked for, 717718. Molesey, East, East Moulsey, co. Surrey, 54. Molesworth, , House of Commons order served on, 321. -, John, a Commissioner for Trade, 99, 210, 424, 616, 653, 709. -, -, esquire Envoy Extraordinary to the Grand Duke of Tuscany, 475. -, [Richard, afterwards Viscount Molesworth], regiment of, 734, 736. -, Robert, Lord Molesworth, letter about Aulnage Duties, 46; memorial of, 50; report sent to, 33, 476. -, William, esquire, his executors etc., grant of the office and offices of Alnager and Collector of the Subsidies of Alnage in Ireland and grant of all Subsidies of Alnage in Ireland, 480, 651; profit of Alnage Duties, paid to, 59, 70. Molie, Martha, pension for, 525. Molley (Molloy), Margaret and Mary. petition of, 35, 41. Molliere, Stephen La, respited half pay officer, 528. Molton, South, co. Devon, hundred, 277. Molyneux (Molineux), , right of tin pre-emption, 662. -, More, a Commissioner for Licensing Hackney Coaches, 489. -, Thomas, esquire, Justice of the Peace for co. Lancaster, 494. Monbairy, co. Banff. See Mountblairy. Monblary, co. Banff. See Mountblairy. Moncal, Andrew, captain, pension for, 522. Moncaster [Muncaster], Roger, of Garstang, executed for high treason, 484. Moncornet, David, lieutenant, pension on the Irish Establishment, 521. 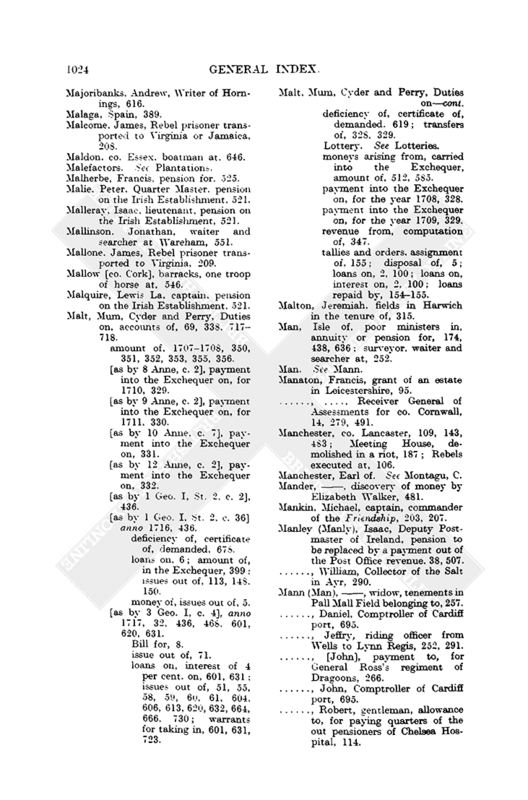 Moncrieff, Thomas, Distributor of Stamps in Perthshire, allowances to, 137; house of, in Perth, 137. Mondell, John, Rebel prisoner transported to Virginia or Jamaica, 208. Money, concealed, discovery of, reward for, 24, 369, 384, 481; intended for France, seizure of, 406; Scots, English equivalent of, 448. Mongaud, James, ensign, respited half pay officer, 528. Mongottiere, Peter la, captain, respited half pay officer, 528. Monings, Thomas, grant of the office of Water Bailiff of the river Severn, 702. Monmouth, county of, distributor of Stamps in. 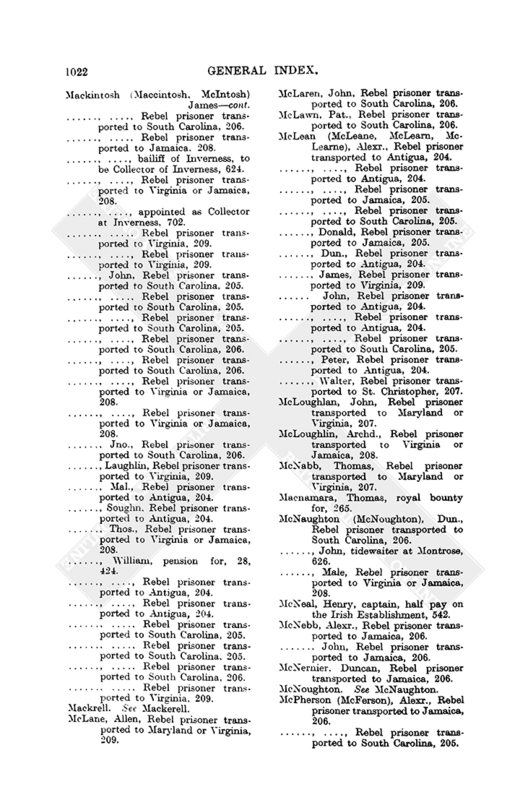 See Powell, R.; Thomas, E.; Receivers General of Taxes. See Caswall, J.; Clifford, T.; Sheriff of. See Walker, J.
Monmouth, Duchess of. See Scott, Anne. Monmouth, Duke of. See Scott, James. 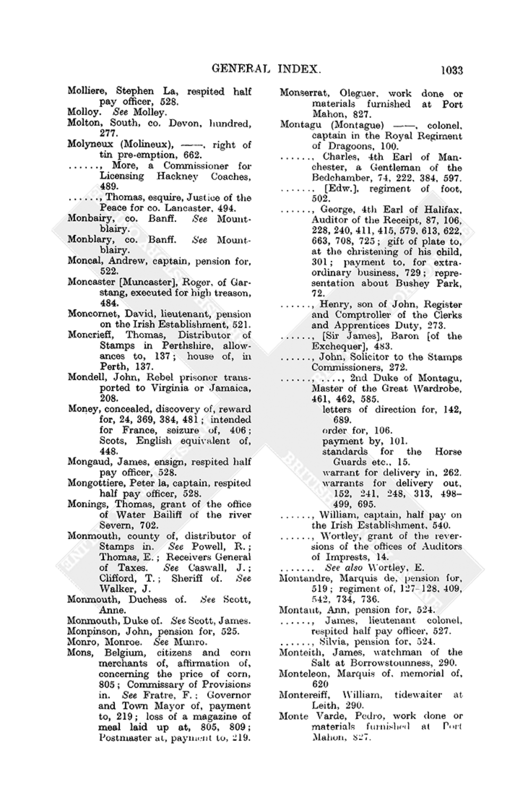 Monpinson, John, pension for, 525. Mons, Belgium, citizens and corn merchants of, affirmation of, concerning the price of corn, 805; Commissary of Provisions in. See Fratre, F.; Governor and Town Mayor of, payment to, 219; loss of a magazine of meal laid up at, 805, 809; Postmaster at, payment to, 219. Monserrat, Oleguer, work done or materials furnished at Port Mahon, 827. Montagu (Montague) , colonel, captain in the Royal Regiment of Dragoons, 100. -, Charles, 4th Earl of Manchester, a Gentleman of the Bedchamber, 74, 222, 384, 597. -, [Edw. ], regiment of foot, 502. -, George, 4th Earl of Halifax, Auditor of the Receipt, 87, 106, 228, 240, 411, 415, 579, 613, 622, 663, 708, 725; gift of plate to, at the christening of his child, 301; payment to, for extraordinary business, 729; representation about Bushey Park, 72. -, Henry, son of John, Register and Comptroller of the Clerks and Apprentices Duty, 273. -, [Sir James], Baron [of the Exchequer], 483. -, John, Solicitor to the Stamps Commissioners, 272. -, -, 2nd Duke of Montagu, Master of the Great Wardrobe, 461, 462, 585.
letters of direction for, 142, 689.
standards for the Horse Guards etc., 15.
warrant for delivery in, 262.
warrants for delivery out, 152, 241, 248, 313, 498499, 695. -, Wortley, grant of the reversions of the offices of Auditors of Imprests, 14. 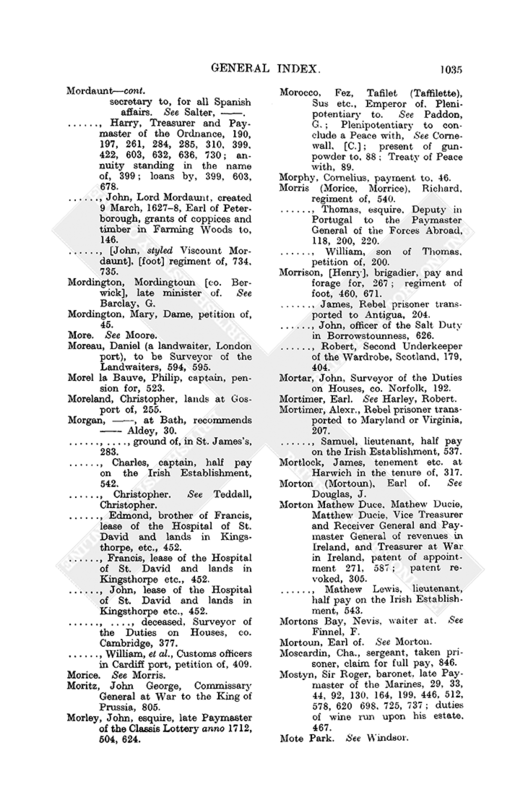 -, See also Wortley, E.
Montandre, Marquis de, pension for, 519; regiment of, 127128, 409, 542, 734, 736. Montaut, Ann, pension for, 524. -, James, lieutenant colonel, respited half pay officer, 527. -, Silvia, pension for, 524. Monteith, James, watchman of the Salt at Borrowstounness, 290. Montereiff, William, tidewaiter at Leith, 290. Monte Varde, Pedro, work done or materials furnished at Port Mahon, 827. Montfort, Peter, lieutenant, pension for, 524. 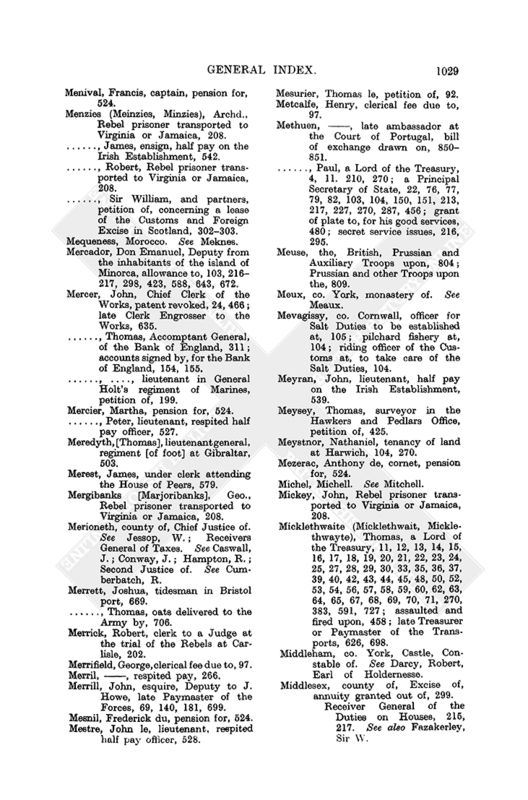 Montgomery, county of, Chief Justice of, salary of, 704. See also Cowper, S.; Jekyll, Sir J. -, large double Judicial seal for, payment for, 494. -, rebellious riots in, 141. -, Receivers General of Assessments. See Burton, S.; Powell, C.
-, Second Justice of. See Jeffreyes, E.
-, tumultuous and rebellious proceedings in, 185, 189. Montgomery, Hugh, Comptroller at Campbelltown, 320. -, James, of Langshaw, Clerk in the Western Circuit, Scotland, 405; Clerk to the Justice Court, Scotland, 403. -, Nich., Rebel prisoner transported to Virginia or Jamaica, 208. -, William, Marshal of the Court of Exchequer. Scotland, 402. -, -, messenger, fee due to, 97. Montigney. Paul, captain, pension on the Irish Establishment, 522. Montolieu de St. Ippolite. See St. Ippolite. Monton, Mounton, within Barton upon Irwel, co. Lancaster, Meeting House, demolished, 187. Montrose, co. Forfar, Collector of Customs at. See Saffin, [J. ]; tidewaiters at, 319, 320, 626. 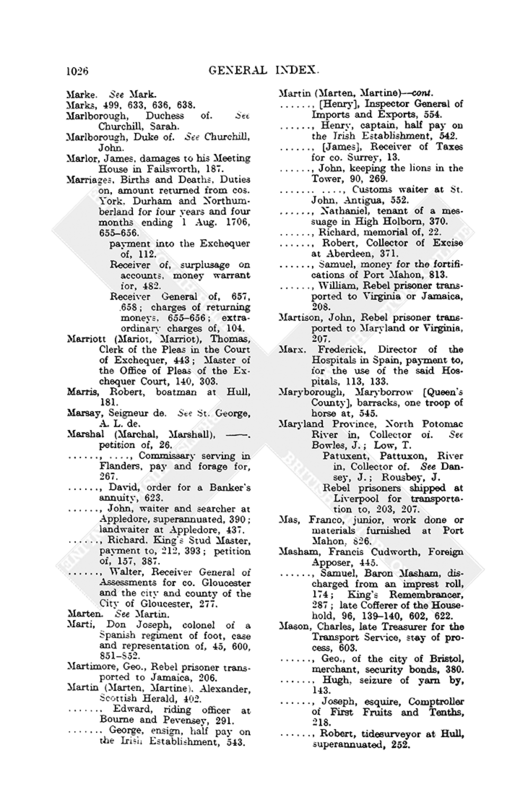 Montserrat, West Indies, Collector of, clerk for, 553; Customs officers at. See Darlow, A.; Mead, W.; Piper, R.; Pitson, J.: Lieutenant Governor of. See Talmash, Thomas. Moody, , deputy to an Auditor of Imprests, 168. -, George, Rebel prisoner transported to Jamaica, 205. -, James, nominee of the Commissioners for stating the Army Debts, 191; issues to, for incidents. 495, 598. 716. -, John, colonel, hire of a vessel for transporting men and women from Newfoundland to Weymouth. 714. Moore (Moor, More), . journey to London, royal warrant allowed for. 43. -, -, Collector of Poole port, seizure of skins by, 690. -, Ambrose, King's waiter, London port, salary, 102. -, Anthony, midshipman, 166, 167. -, Arthur, a Comptroller of the Accounts of the Army, 99, 130, 616, 709. -, George, Collector of Berwick port, 300. -, -, Collector at Barnstaple, 291. -, Gilbert, Commissary of provisions for the Forces in North Britain, accounts, 508509, 669672: providing dry forage etc. for an encampment, 363, 606. -, John, Collector of Philadelphia port, 497. -, Miles, Rebel prisoner transported to South Carolina, 205. -, Thomas, clerical fee due to, 97. -, -, late Paymaster General [of Army Debentures], memorial of, 70: late Paymaster of the Forces Abroad, accounts, 115. -, Sir William, baronet, petition for a pension, 51. Moorefield, William, lands at Harwich, 317. Mops, for the House of Commons, 320321, 724; for the Treasury Office, 592. Moratzi, Domingo, work done or materials furnished at Port Mahon, 827. Moray, bishopric of, Collector of rents in. See Murray, A.
Moray, Murray, [Excise] collection of, Collector of, additional salary for, 651. Mordaunt, Charles. 3rd Earl of Peterborough, Ambassador Extraordinary to several Princes in Italy in 1712, 643. -, General to the King of Spain, 852. -, order of, in 1706, for raising a Spanish regiment of foot, 851. -, payment by, for mules, out of allowance for Forage and Waggon money, 117, 118. -, secretary to, for all Spanish affairs. See Salter, . -, Harry, Treasurer and Paymaster of the Ordnance, 190, 197, 261, 284, 285, 310, 399, 422, 603, 632, 636, 730; annuity standing in the name of, 399; loans by, 399, 603, 678. -, John, Lord Mordaunt, created 9 March, 16278, Earl of Peterborough, grants of coppices and timber in Farming Woods to, 146. -, [John, styled Viscount Mordaunt], [foot] regiment of, 734, 735. Mordington, Mordingtoun [co. Berwick], late minister of. See Barclay, G.
Mordington, Mary, Dame, petition of, 45. Moreau, Daniel (a landwaiter, London port), to be Surveyor of the Landwaiters, 594, 595. Morel la Bauve, Philip, captain, pension for, 523. Moreland, Christopher, lands at Gosport of, 255. Morgan, , at Bath, recommends Aldey, 30. -, -, ground of, in St. James's, 283. -, Charles, captain, half pay on the Irish Establishment, 542. -, Christopher. See Teddall, Christopher. -, Edmond, brother of Francis, lease of the Hospital of St. David and lands in Kingsthorpe, etc., 452. -, Francis, lease of the Hospital of St. David and lands in Kingsthorpe etc., 452. -, John, lease of the Hospital of St. David and lands in Kingsthorpe etc., 452. -, -, deceased, Surveyor of the Duties on Houses, co. Cambridge, 377. -, William, et al., Customs officers in Cardiff port, petition of, 409. Moritz, John George, Commissary General at War to the King of Prussia, 805. Morley, John, esquire, late Paymaster of the Classis Lottery anno 1712, 504, 624. Morocco, Fez, Tafilet (Taffilette), Sus etc., Emperor of. Plenipotentiary to. See Paddon, G.; Plenipotentiary to conclude a Peace with, See Cornewall, [C.]; present of gunpowder to, 88; Treaty of Peace with, 89. Morphy, Cornelius, payment to, 46. Morris (Morice, Morrice), Richard, regiment of, 540. -, Thomas, esquire. Deputy in Portugal to the Paymaster General of the Forces Abroad, 118, 200, 220. -, William, son of Thomas, petition of, 200. Morrison, [Henry], brigadier, pay and forage for, 267; regiment of foot, 460, 671. -, James, Rebel prisoner transported to Antigua, 204. -, John, officer of the Salt Duty in Borrowstounness, 626. -, Robert, Second Underkeeper of the Wardrobe, Scotland, 179, 404. Mortar, John, Surveyor of the Duties on Houses, co. Norfolk, 192. Mortimer, Earl. See Harley, Robert. Mortimer, Alexr., Rebel prisoner transported to Maryland or Virginia, 207. -, Samuel, lieutenant, half pay on the Irish Establishment, 537. Mortlock, James, tenement etc. at Harwich in the tenure of, 317. Morton (Mortoun), Earl of. See Douglas, J.
Morton Mathew Duce, Mathew Ducie, Matthew Ducie, Vice Treasurer and Receiver General and Paymaster General of revenues in Ireland, and Treasurer at War in Ireland, patent of appointment 271, 587; patent revoked, 305. -, Mathew Lewis, lieutenant, half pay on the Irish Establishment, 543. Mortons Bay, Nevis, waiter at. See Finnel, F.
Mortoun, Earl of. See Morton. Moscardin, Cha., sergeant, taken prisoner, claim for full pay, 846. Mostyn, Sir Roger, baronet, late Paymaster of the Marines, 29, 33, 44, 92, 130, 164, 199, 446, 512, 578, 620, 698, 725, 737; duties of wine run upon his estate, 467. Mottarshed, John, tidesman. London port, 132. Motte, Jacob la, pension for, 524. -, John la, pension for, 525. -, Olimpia la, pension for, 525. Motte Belleau, la, captain centn., pension on the Irish Establishment. 522. Motte Blagney, Motte Blagny, Jacob de la, distribution of bounty to French Refugiez, 46: pensions paid by, 44, 562. Motte Brocas, Gabriel la. lieutenant, pension for, 523. Motte Cercler, Marc la, respited half pay officer 527. Motte Champy, John la, lieutenant, respited hah pay officer. 527. Motte Grindor, Samuel la, lieutenant, pension on the Irish Establishment, 522. Moubray, William, Rebel prisoner transported to Maryland or Virginia, 207. Mouline, Mary la, pension for, 524. Mountblairy, Monbairy, Monblary, co. Banff, lands and barony and Boge and Mains of, 470. Mountfort, John, a clerk to the Commissioners of Transports, 418. Mountjoy, co. Tyrone, castle or lands of, lease of, 46, 578. Mountjoy Viscount. See Stewart, William. Mounton, co. Lancaster. See Monton. Mousehole [co. Cornwall], tidesmen and boatmen at, 551; waiter and searcher at, 551. Mowatt, Antonette, Dame, pension for, 519. 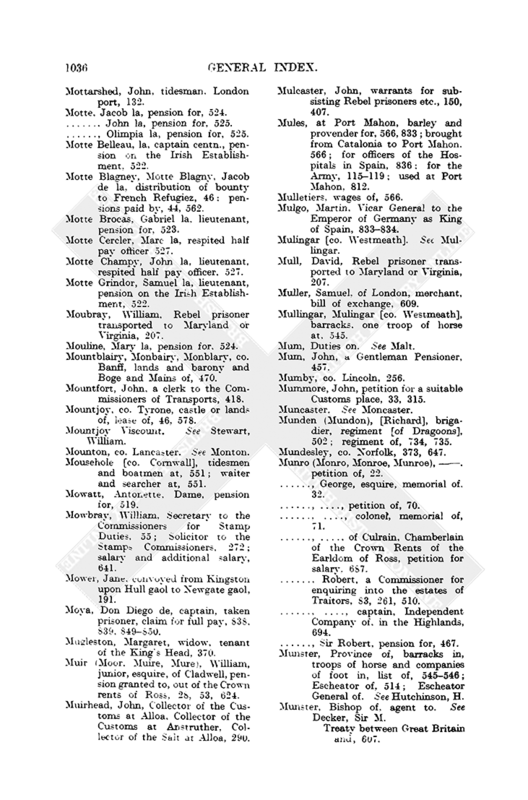 Mowbray, William, Secretary to the Commissioners for Stamp Duties, 55; Solicitor to the Stamps Commissioners, 272; salary and additional salary, 641. Mower, Jane, convoyed from Kingston upon Hull gaol to Newgate gaol, 191. Moya, Don Diego de, captain, taken prisoner, claim for full pay, 838, 839, 849850. Mugleston, Margaret, widow, tenant of the King's Head, 370. 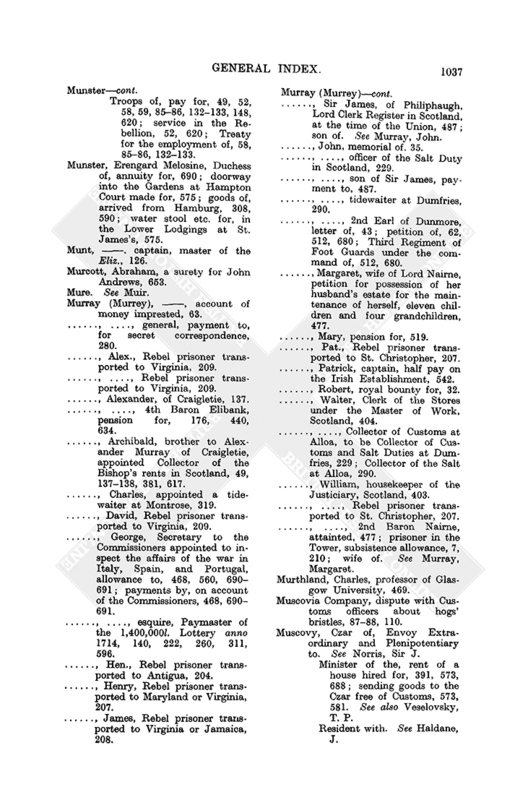 Muir (Moor, Muire, Mure), William, junior, esquire, of Cladwell, pension granted to, out of the Crown rents of Ross, 28, 53, 624. Muirhead, John, Collector of the Customs at Alloa, Collector of the Customs at Anstruther, Collector of the Salt at Alloa, 290. Mulcaster, John, warrants for subsisting Rebel prisoners etc., 150, 407. Mules, at Port Mahon, barley and provender for, 566, 833; brought from Catalonia to Port Mahon. 566; for officers of the Hospitals in Spain, 836; for the Army, 115119; used at Port Mahon, 812. Mulgo, Martin, Vicar General to the Emperor of Germany as King of Spain, 833834. Mulingar [co. Westmeath]. See Mullingar. Mull, David, Rebel prisoner transported to Maryland or Virginia, 207. Muller, Samuel, of London, merchant, bill of exchange, 609. Mullingar, Mulingar [co. Westmeath], barracks, one troop of horse at, 545. Mum, Duties on. See Malt. Mum, John, a Gentleman Pensioner, 457. Mummore, John, petition for a suitable Customs place, 33, 315. Munden (Mundon), [Richard], brigadier, regiment [of Dragoons], 502; regiment of, 734, 735. Mundesley, co. Norfolk, 373, 647. Munro (Monro, Monroe, Munroe), . petition of, 22. -, George, esquire, memorial of. 32. -, -, petition of, 70. -, -, colonel, memorial of, 71. -, -, of Culrain, Chamberlain of the Crown Rents of the Earldom of Ross, petition for salary. 687. -, Robert, a Commissioner for enquiring into the estates of Traitors, 83, 261, 510. -, -, captain, Independent Company of. in the Highlands, 694. -, Sir Robert, pension for, 467. Munster, Province of, barracks in, troops of horse and companies of foot in, list of, 545546; Escheator of, 514; Escheator General of. See Hutchinson, H.
Munster, Bishop of, agent to. See Decker, Sir M.
-, Treaty between Great Britain and, 607. Troops of, pay for, 49, 52, 58, 59, 8586, 132133, 148, 620; service in the Rebellion, 52, 620; Treaty for the employment of, 58, 8586, 132133. Munster, Erengard Melosine, Duchess of, annuity for, 690; doorway into the Gardens at Hampton Court made for, 575; goods of, arrived from Hamburg, 308, 590; water stool etc. for, in the Lower Lodgings at St. James's, 575. Munt, . captain, master of the Eliz., 126. Murcott, Abraham, a surety for John Andrews, 653. Murray (Murrey), , account of money imprested, 63. -, -, general, payment to, for secret correspondence, 280. -, Alex., Rebel prisoner transported to Virginia, 209. -, Alexander, of Craigletie, 137. -, -, 4th Baron Elibank, pension for, 176, 440, 634. -, Archibald, brother to Alexander Murray of Craigletie, appointed Collector of the Bishop's rents in Scotland, 49, 137138, 381, 617. -, Charles, appointed a tidewaiter at Montrose, 319. -, David, Rebel prisoner transported to Virginia, 209. -, George, Secretary to the Commissioners appointed to inspect the affairs of the war in Italy, Spain, and Portugal, allowance to, 468, 560, 690691; payments by, on account of the Commissioners, 468, 690691. -, -, esquire, Paymaster of the 1,400,000l. Lottery anno 1714, 140, 222, 260, 311, 596. -, Hen., Rebel prisoner transported to Antigua, 204. -, Henry, Rebel prisoner transported to Maryland or Virginia, 207. -, James, Rebel prisoner transported to Virginia or Jamaica, 208. 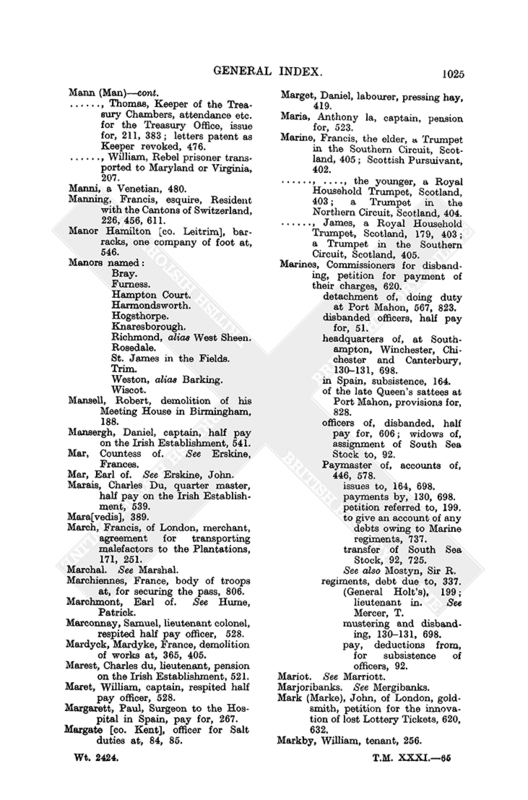 -, Sir James, of Philiphaugh, Lord Clerk Register in Scotland, at the time of the Union, 487; son of. See Murray, John. -, John, memorial of. 35. -, -, officer of the Salt Duty in Scotland, 229. -, -, son of Sir James, payment to, 487. -, -, tidewaiter at Dumfries, 290. -, -, 2nd Earl of Dunmore, letter of, 43; petition of, 62, 512, 680; Third Regiment of Foot Guards under the command of, 512, 680. -, Margaret, wife of Lord Nairne, petition for possession of her husband's estate for the maintenance of herself, eleven children and four grandchildren, 477. -, Mary, pension for, 519. -, Pat., Rebel prisoner transported to St. Christopher, 207. -, Patrick, captain, half pay on the Irish Establishment, 542. -, Robert, royal bounty for, 32. -, Walter, Clerk of the Stores under the Master of Work, Scotland, 404. -, -, Collector of Customs at Alloa, to be Collector of Customs and Salt Duties at Dumfries, 229; Collector of the Salt at Alloa, 290. -, William, housekeeper of the Justiciary, Scotland, 403. -, -, Rebel prisoner transported to St. Christopher, 207. -, -, 2nd Baron Nairne, attainted, 477; prisoner in the Tower, subsistence allowance, 7, 210; wife of. See Murray, Margaret. Murthland, Charles, professor of Glasgow University, 469. Muscovia Company, dispute with Customs officers about hogs' bristles, 8788, 110. Muscovy, Czar of, Envoy Extraordinary and Plenipotentiary to. See Norris, Sir J. -, Minister of the, rent of a house hired for, 391, 573, 688; sending goods to the Czar free of Customs, 573, 581. See also Veselovsky, T.P. -, Resident with. See Haldane, J.
Musgrave, Phillip, receiving and delivering out Post Office candles, 232. 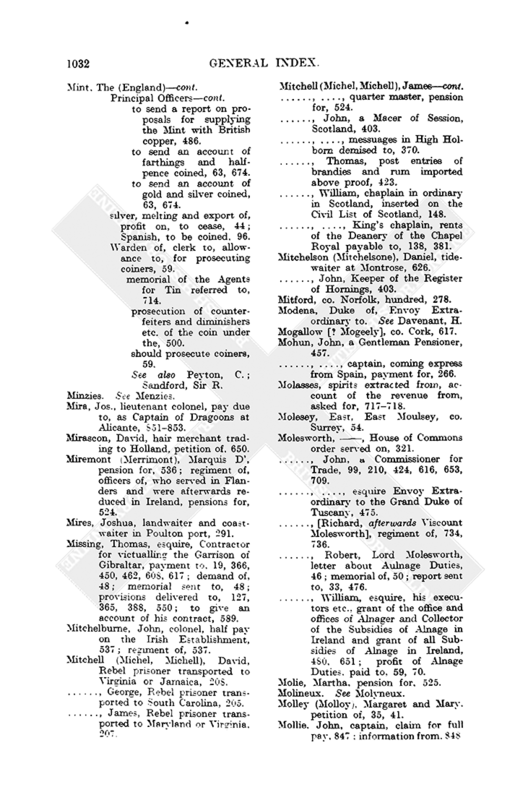 Muslins, calicoes etc., Duties on [as by 1112 Wm. III, c. 3, made perpetual by 7 Anne, c. 30], 15 per cent. 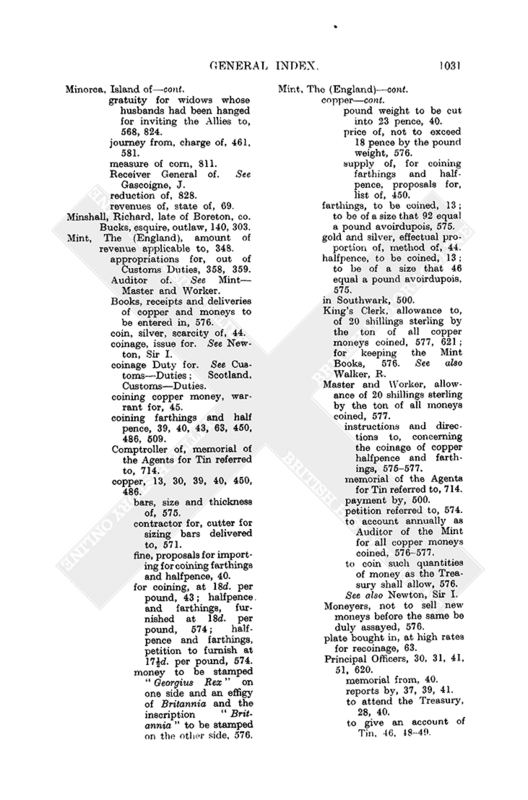 Duty, 346; income from, 81; increased, 214; receiving and paying, allowance for clerks for, 233. -, [as by 34 Anne, c. 18], 346. -, [as by 34 Anne, c. 18, and 6 Anne, c. 50, and 7 Anne, c. 30], receiving and paying, allowance for clerks for, 233. -, [as by 10 Anne, c. 18], 3d. a yard on, 237; accounts, 338. -, [as by 1 Geo. I, St. 2, c. 12], increased, 237. -, moneys arising from, carried into the Exchequer, 585. -, receipts from, 355, 356357. Musse, Samuel Comte de la, captain, pension on the Irish Establishment, 522.